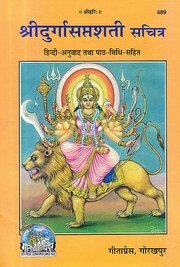 The Durgasaptashati is well accepted religious text of Hindu religion. Durgasaptashati is full of religious mystery with blessed story of goddess Bhagavati. The devotees motivated by desire and desire less both recite this book with great reverence and attain their desired goal. The book contains is it the procedure of reciting it along with Kavacha, Argal, Kilaka, Vaidika and Tantrika Ratrisukta, Devyatharvashirsha, Navarna Vidhi, original text, Durgashtottaranamastotra, Sri Durgamanasa worship, all the three Rahasyas (secrets), prayer of pardon (Kshama Prarthna), Siddhikunzikastotra and waving light before the idol. Ya its excellent ! Incredible, Great. ..